Woke at 5am to what sounded like the rattle of rain on the metal hostel roof, but when I went outside, discovered it was giant palm fronds brushing the roof in the wind. Saw the orangey yellow sky as the sun rose, then the gray rain clouds moved in. Passed a camel farm, on the bus on my way to Uluru, sacred land of the Aborigines, renamed Ayers Rock by some white guy named Ayers, then renamed Uluru back again, in respect to the Aboriginal people. My new women friends all said that they really felt the spirituality of the place. A young guy at the hostel said it was a waste of time, a long drive just to see a rock. Guess it’s in the eye of the beholder. Rode through miles & miles of gold scrub & low bushy green trees sticking out of rusty red earth, with an occasional sprinkle of rain. A few cows milled about & the bus driver warned us to wear our seat belts as he sometimes stops hard for camels & kangaroos crossing the road. He told us there are a million feral camels in Australia. Back in the days of building the railroads, they imported camels to help as the horses couldn’t handle the heat. Afghan camel drivers came with them, however when their services were no longer needed the Afghans were told to destroy their camels. But the camels were their friends, so instead they let them go. They’ve since multiplied exponentially. 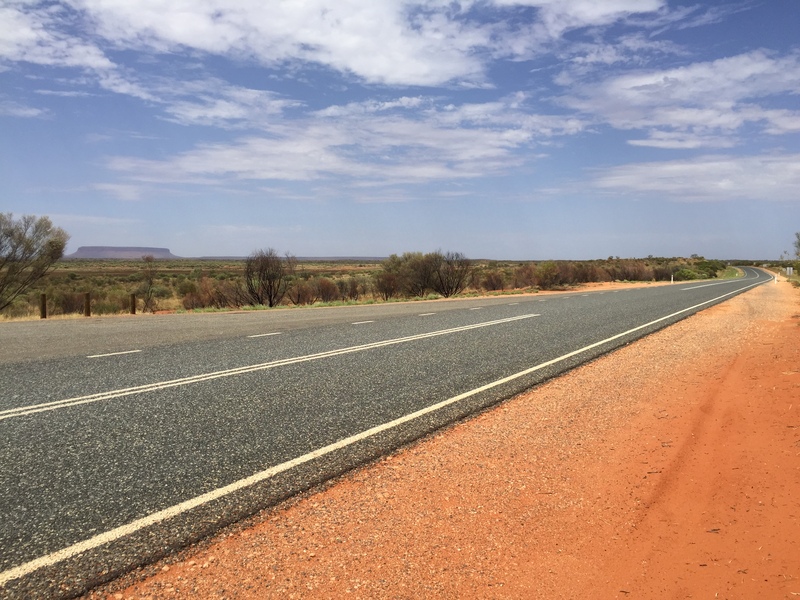 It’s a long drive from Alice Springs to Uluru, about 5 hours each way. The bus was comfortable enough, a big coach, with only 16 tourists (or adventurers, as our guides called us.) They were great, Tic & Lindsay, 2 crusty old gray haired Aussie men, one with a long fuzzy gray fu man chu mustache. Joked around all day, informative & funny. Told us we were getting eggs & bacon for breakfast but handed us a juicebox & granola bar instead (our “lobster sandwich” for lunch turned out to be packaged ham & cheese). 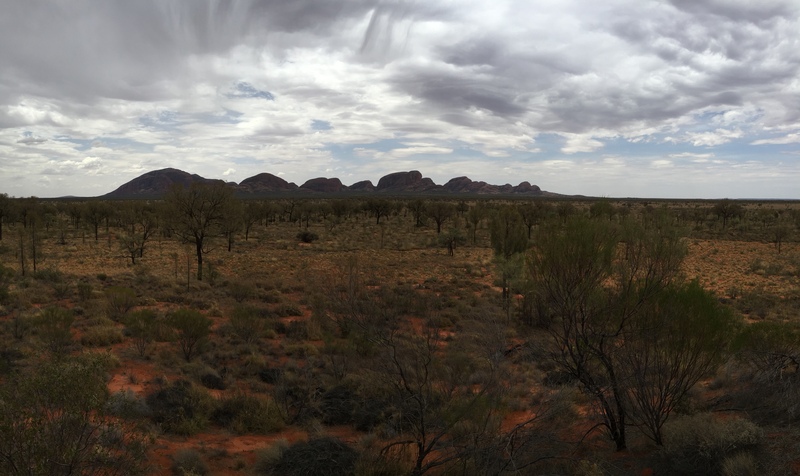 We passed most of the miles under gray cloudy skies, and finally arrived first at the Olga’s, or Kata Tjuta, as it’s known again. Big beautiful undulating rocks, flat & gray to photograph, due to the lack of sun, but nonetheless still impressive. We were allowed time to walk the path on our own for a bit. It’s a sacred ceremony site for male aborigines so certain parts were off limits & not to be photographed. It was super hot, well over 100, and the flies were buzzing & dive bombing, so I was glad for the fly net which covered my head. 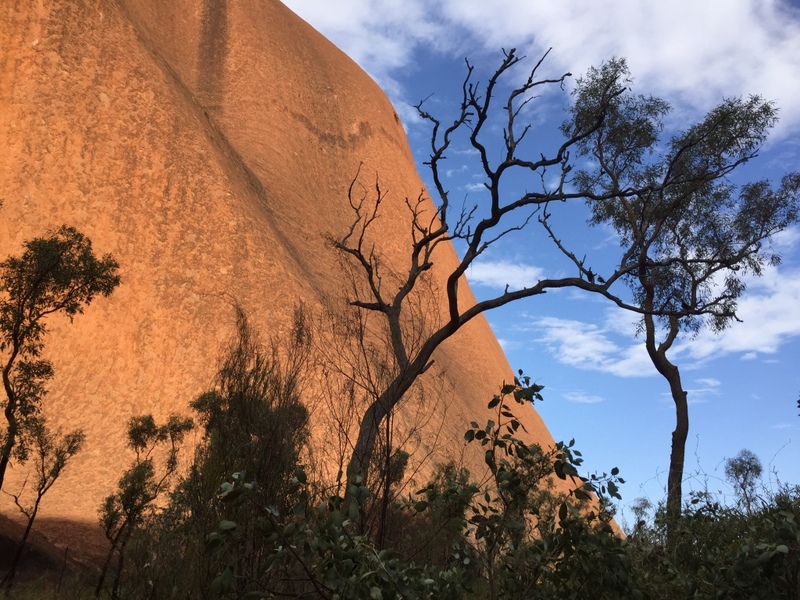 In the afternoon, while trekking around the base of Uluru, the sun blasted through, the sky turned brilliant blue & the rock turned a radiant red. After much walking & sweating, we were all glad to sit outside at a picnic table in the sunset viewing area and sip sparkling wine while waiting for Tic & Lindsey to grill the snags (what the Aussies call sausages) & onions & set out the salads for dinner. 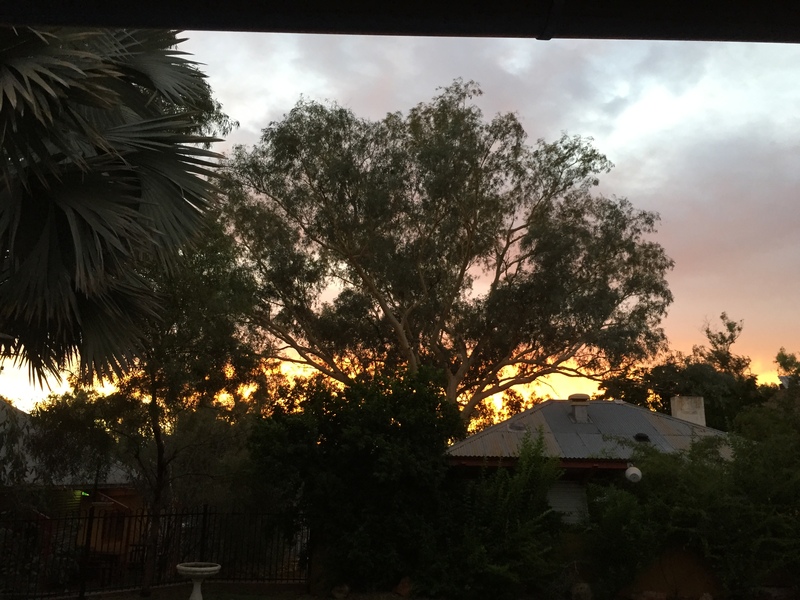 By this time, the sun had disappeared & Uluru was back to flat brown. No red glow tonight, they informed us. But what happened next was even better! Right at the end of our meal, jags of lightning streaked through the sky! Uluru lit up, just slightly, and a little to the side of it the sunset glowed peach & pink & yellow. Then the heavens started a light show, throwing jagged daggers of electricity all around us! On the way back, rain came down so hard I wondered how the driver could see (he told me later at our one bathroom stop that he couldn’t see, he just tried to keep it between the white posts.) Huge bursts of lightning lit up the sky, then just when we were pulling in to the roadhouse (which was closed but Lindsay knows where they stow the key) the rain miraculously stopped, so we didn’t get drenched! The wind was blowing hard enough to almost send me airborn & there was a slight sandstorm, plus giant cockroaches had claimed the bathroom as their own, but that just made it a true outback experience. About a 20 hour day, from the time we left at 6am until we returned at 1am, but totally worth it. If you’re thinking of seeing Uluru, I recommend you go for the 2 day trip and spend a night out there under the stars so you can also witness the sunrise. Feral camels? We’re not in Kansas,Toto. OK,this sounds absolutely exciting. Well, except forthe sausages. :) But what an adventure! Keep up the great writing! ( I have finally found your blog! But better late than never, right? 🙂 Hugs, friend. T.
Glad you found me, Therese!